I bought the MiniPro 310Wh from a local hypermarket sale last week. 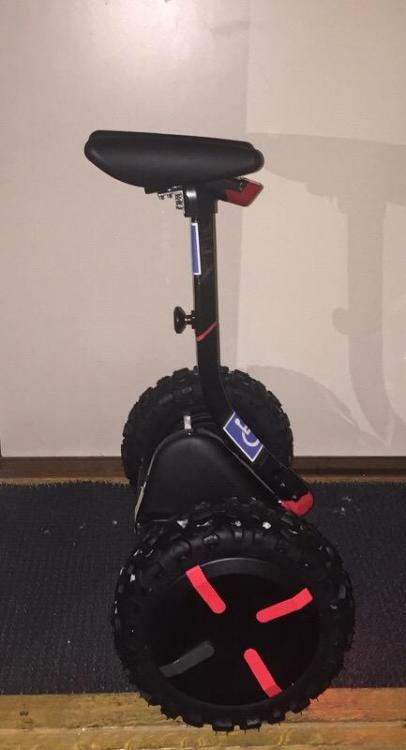 I have trouble walking due to a disease, so I planned on using the Mini mainly for riding to the parking lot and other small distances. 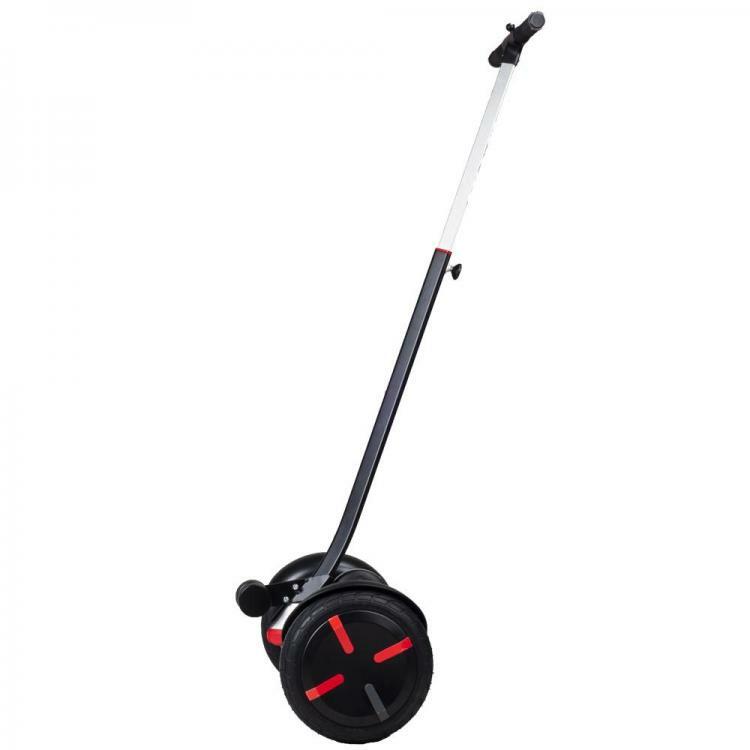 Having ridden EUCs for a few years and the Airwheel A3 even longer, getting familiar with the riding experience was quite fast. And it is even more fun than I expected! But the stock one is a joke of a tire in snow, and can only be ridden on smooth surfaces. I went in all the way and ordered the off-road tires from More4Mini. Tires arrived very fast in just 3 days to Finland, and installing them with reinforced bicycle tire irons, grease, and the zip tie tip was not hard at all. My drill is packed for moving so I didn't get to modify the fenders just yet. But having the fender support bars in place keeps my shoe from sliding to touch the tire. Comparing the off-road tires to the originals is a bit pointless, as the originals can't really be ridden in snow. Once I started to trust the grip, it's a magical feeling to lean forward at 10km/h when the ground is covered in heavy snow that is largely stomped in! As the new tires have a load rated for astonishing 189kg per tire and the riding surface is very rough, 1.3 bars seems to be the maximum I'd recommend. I'm yet to test how low I could go. While the grip is magnificent, I did notice that when the grip is anything less than 100%, the MiniPro firmware works against me. If the tire skids even a bit (which the off-road tire does when it digs in the snow), the MiniPro tries to slow me down by tilt-back, when actually it would be best to let the tire skid a bit more. People who have parked a car in heavy snow know that the traction system is best left off. Same here. Especially the ability to climb a snowy uphill is hindered by the firmware. I will reply to this thread with updates later on. Meanwhile, fun times, fun times indeed!! 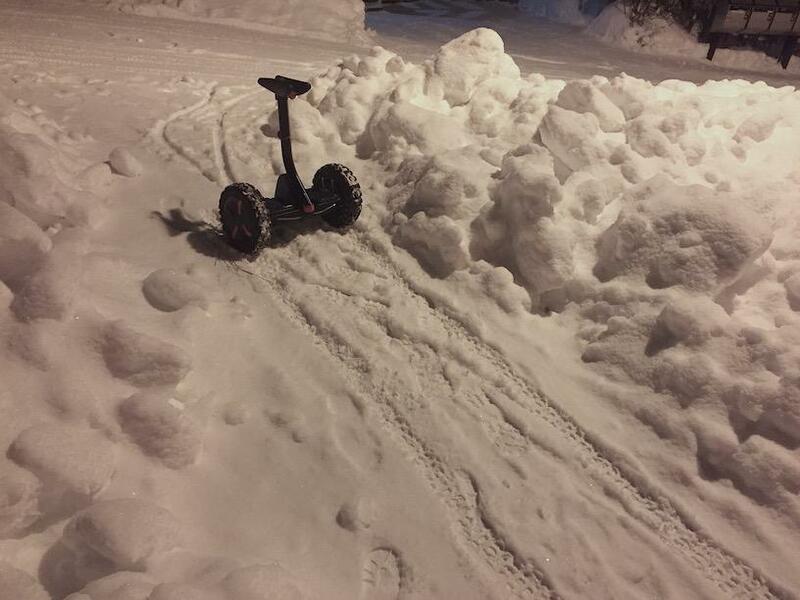 I’ve done snow with my MiniPro, the only way to not fall is using a handlebar. You need the counterbalance of the bars. The tires cannot achieve this. It will probably help, but I don’t agree on it being the only way. The inhibiting tilt-back on the latest firmware might even be worse when there is a handlebar on front of you. Now I can push through a bit. I have started to develop a technique where I squeeze my knees and push down on the knee pads when the road is rough. But if I were on stock tires, I couldn’t advance one meter right now, no matter the technique, handlebars or other accessories involved. But the off-road tires are magnificent in this weather! I eventually went down to 0.8 bars on the tires. That was a bit too low. I seem to be setting on 1.0 bars. I keep adjusting and testing different riding modes. The main issue is the tilt-back that starts immediately when I step on, and gets worse already at 5km/h. The Mini probably thinks that I’m going uphill all the time, since the resistance is quite severe on the thicker snow. Hard setting makes the tilt-back slightly more aggressive, but a soft setting tilts forward so much that the Mini invokes a panic tilt-back bringing me almost to a stop. I’m now switching between automatic and medium settings. In dry off-road conditions I use 10-15psi for those tyres. Have gone as low as 6psi without separation. That’s good to hear, thanks! The feeling changed quite drastically when going down from 15 psi (1.0 bars), so I thought I was nearing a danger zone. Today the road was very rough, and indeed the 15 psi felt quite harsh. I have to try the sub-par (ha!) pressures again. As I weigh past 90kg (~200lbs), I try not to go too low. Just to note, I measure the pressure at room temperature. The actual riding pressure is lower since it is -15•C outside. Lower Tire pressure on the Segway mini really doesn’t have much of an effect. The handlebars have a very huge effect as you can counterbalance the mini’s self balancing system. It’s very simple physics. tire pressures do not assist the mini in balancing much at all and actually have a negative effect on its performance. Does not matter what Firmware you are using. the biggest factor riding the mini off-road is going to be your balancing skills. i have ridden my mini off road on MTB courses and while it’s fun you will have to jump off of it quite often. riding the same course with a handlebar you can counterbalance your upper body weight. a perfect example is my buddy rides a unicycle off-road for fun and has a MTB handlebar attachment on his rig. With the handlebar he kills the course ... without It, he is significantly slower. I took a ride with 0.7 bars (10psi) on the tires. I didn’t feel the comfort I’d expect from such low pressure, instead they felt flat. I increased a bit, and I think I’m now very close to optimal for my weight. Must wait for them to warm up to get a reading, but I’d guess I’m at around 13psi. Lower Tire pressure on the Segway mini really doesn’t have much of an effect. It does, but not in something you seem to care about. I get it, you like the handlebars. And I’m sure they are great. But they don’t affect the grip or shock absorbing properties of the Mini. They affect balance. But if I would ever go on a MTB track with the MiniPro, I would keep in mind that with handlebars I would be faster. Handlebars off-road can be quite dangerous if you rely too much on them to steady you. 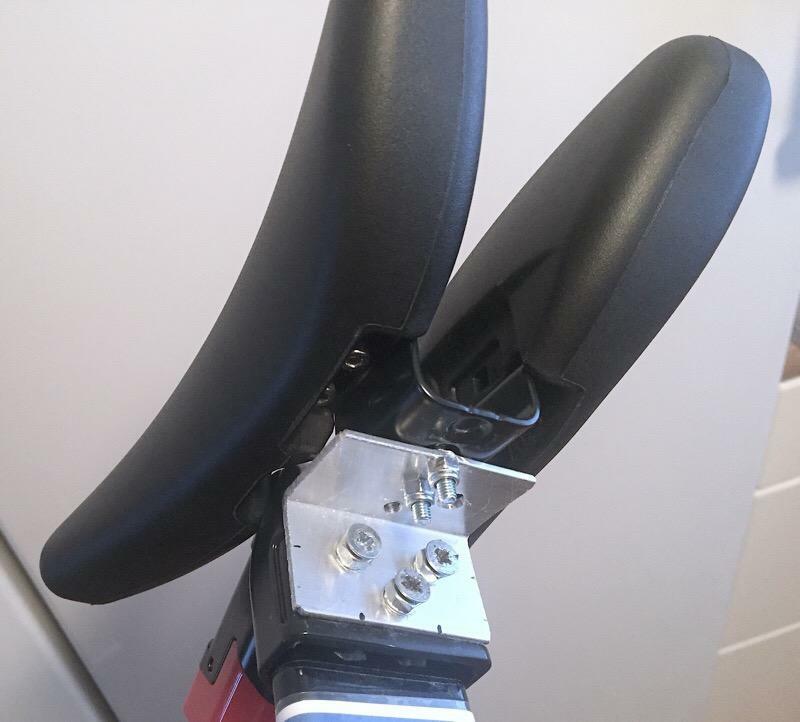 The MiniPro is not designed to be firmly anchored in space by a heavy weight (a rider firmly holding handlebars), nor is a rider able to trust the minor and major motions a miniPRO transfers to a handlebar when it hits an obstacle (eg a 1" gutter). If you look at my avatar you can see that I made my own soft-handlebars out of plastic pipe. They give a reference-in-space, enough to assist rider balance, but yet compliant ('bendy') enough to absorb the shocks when hitting pine cones, etc. They are also light enough to balance upright without needing a stand. I don’t ride with handlebars, listen no amount of skill or balance will defy physics. As we all know, the MiniPro is eager to slow the rider down by an overly enthusiastic tilt-back. 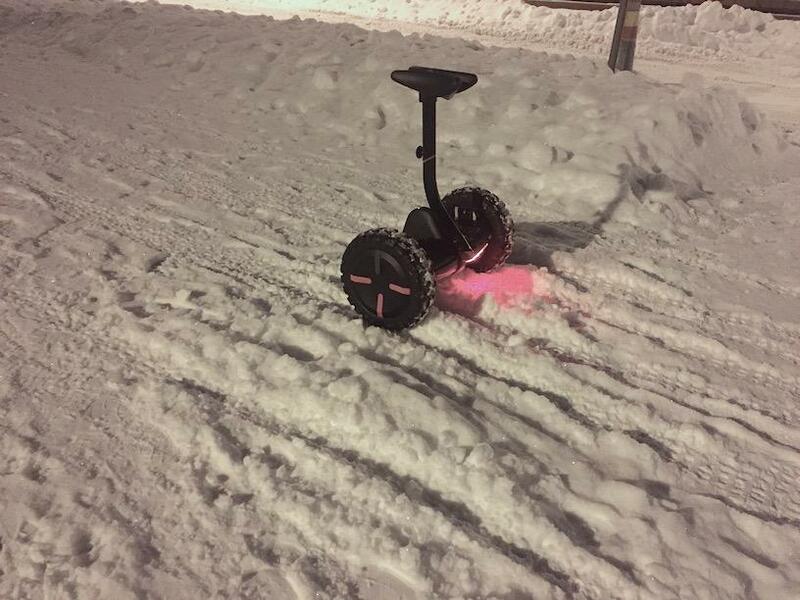 Add knobby tires and 3” of unevenly packed snow and the MiniPro thinks you are riding a steep uphill all the time, which results in constant tiltback starting at just 5km/h. As the knee pads are barely forward enough for tall people as is, crouching even a bit makes the knee pads slide behind the knees. I planned on 3D-printing the bracket from Thingverse, but I wasn’t sure when I’d be able to do that. And the announced 4cm didn’t feel like much. So I gathered what tools and material I had available in the middle of moving houses and found an intermediate solution. Turns out you don’t need more than a 90• angled piece of fe. aluminium, a drill and a few bolts with nuts. Now the thicker, softer side of the knee pads is against my knees, around 3” forwards from original. Now I can ride the tilt-back a lot safer and with comfort, and actually go forward faster than walking. One should of course never ride the tilt-back, but ironically in the name of safety, Ninebot has left us no choice. That’s good to hear, thanks! The feeling changed quite drastically when going down from 15 psi (1.0 bars), so I thought I was nearing a danger zone. Today the road was very rough, and indeed the 15 psi felt quite harsh. With the knobblies, there is a resonance on a bitumen road once the tire starts acting like the balloon it should be. Actually, there is always a resonance, but high pressure shifts it up above the riding speeds you normally use. Thus the "roughness" depends on both pressure and speed. In fact, you can use the "rough feeling" or "vibration" to ensure that the knobblies are properly inflated if you ride. Lower pressures mean "vibration" at a lower speed. Interesting that the MiniPRO doesn't seem to be bothered as much as the rider by this (relatively) high frequency "vibration". 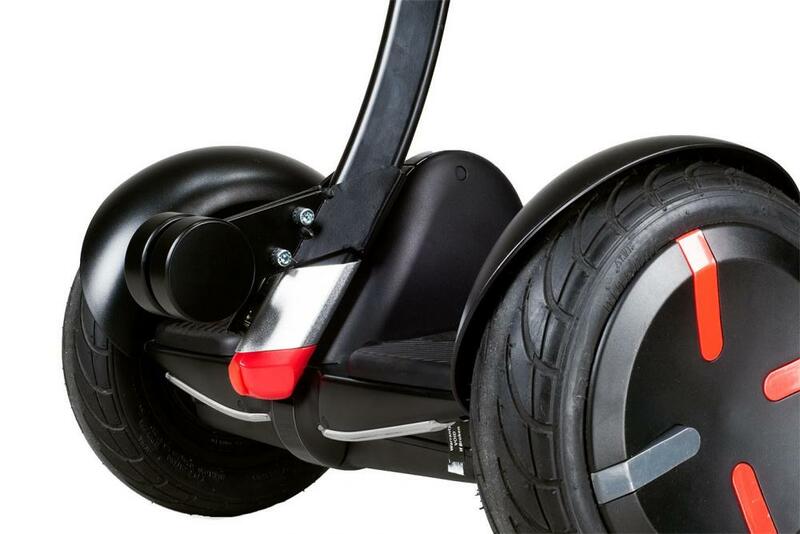 The Mini Pro and all segways use a vibration structured gyro. In conjunction with their accelerometer... Google coriolis effect. It’s designed to work with vibration not against it. I read about the vibration beforehand, but as it is very snowy right now over here, I’ve only gotten to experience it once myself. What I meant and to which I’m sensitive to are the shock absorbing properties of the tire. At 0.8bars (12psi) the tire is extremely loose when riding on a flat surface, yet on unevenly packed snow (like gobblestones) it is not at all soft and comfortable like I’d expect. Instead every bump is harsh. Already at 0.9bars (14psi), while the ride didn’t really get any more harsh, it acts much nicer on a flat surface. I too believe this is due to the very rigid tire. A softer and/or thinner rubber would surely deform faster on bumps. @trevmar, was it you who planned on replacing the motor current sense resistors on the MiniPro to lessen the ”penalty points” on uphill? Did you ever get to doing it? was it you who planned on replacing the motor current sense resistors on the MiniPro to lessen the ”penalty points” on uphill? Did you ever get to doing it? Me too, the moment they get the Bluetooth flashing app for sale. Meanwhile I did buy a set of tyres from China which is soft and works out well. Have you read the blog written by a member of the design team? You can get counterbalance from more4mini now. Works like a charm when handlebar is installed. Last night the melting snow had frozen again, forming a solid surface that gives in just enough to let the off-road tire knobs to dig in. Moon was high up, round and bright. I found a cross-country skiing track, perhaps 4km long, made around the fields of a local golf court. As I wasn’t spoiling the track, I went for a ride, and rode through the whole track. And it was the funnest ride I’ve had this winter!